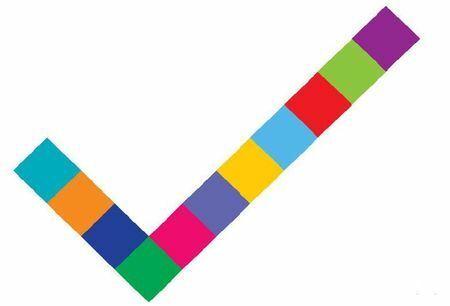 Last night the Pet Shop Boys performed a medley that incorporated no less than 16 of their songs at London's Earl's Court during the Brit Awards, where the duo were recognized in the Outstanding Contribution To Music category. 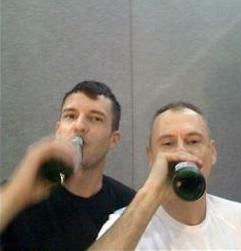 And today on the Boys' official website, Neil Tennant posted a photo of Chris Lowe knocking back a beer last night with The Killers' Brandon Flowers (right), who guested on "It's A Sin" and "West End Girls" last night. The duo have also remixed Lady GaGa's "Eh Eh (Nothing Else I Can Say)," and their version is being offered today as a free download from AOL Music. Meanwhile, the PSBs new album Yes (cover art pictured above) is out March 23, and it was announced this week that a limited two-disc edition titled etc. will be made available. In addition to the six album track dub mixes that will appear on the bonus disc, there will also be a brand new Pet Shop Boys composition featuring none other than Phil Oakey of the Human League, titled "This Used To Be The Future." Say Neil and Chris: "The inspiration for this bonus album came from The Human League's 1982 dub album, Love and Dancing. literally socked you in the gut…"
I'm using this as a call to arms for all music-loving Towleroad readers. I'll post mine below. But let us know yours, too! TWO MORE CLIPS FROM THE BRITS: Take That get intergalactic while performing "Greatest Day," and multiple award winner Duffy does "Warwick Avenue." 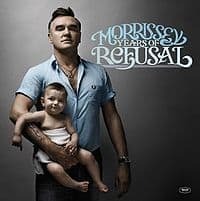 Morrissey's ninth studio album Years of Refusal. Producer Jerry Finn had just finished work on the record last year when he suffered a cerebral hemorrhage last July. He was taken off life support in August last year, and passed away two weeks later. 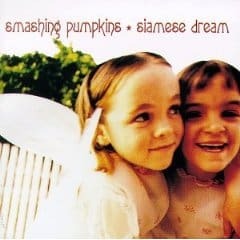 In addition to Morrissey's own You Are The Quarry, Finn had also produced Blink 182's Enema Of The State and mixed Green Day's Dookie. Anastacia's Heavy Rotation, featuring production by JR Rotem, Rodney Jerkins and Lester Mendez. It's her first album since 2004, and fourth overall. New singles from Jim Jones ("Na Na Nana Na Na"), Rick Ross ("Mafia Music) and The-Dream ("Rockin That Sh*t).